CanAm Enterprises has repaid its 37th EB-5 partnership in full and on time. The $40 million EB-5 loan helped fund the first phase of construction of the Gulfport Marine Terminal in Staten Island, NY. The 37th repayment further establishes CanAm Enterprises as the industry leader with over $1 billion in EB-5 capital repayments. The $40 million EB-5 loan through CanAm’s New York Metropolitan Regional Center helped fund the first phase of construction of the Gulfport Marine Terminal. “I am genuinely proud of the Gulfport Marine Terminal project – it shows that EB-5 is a great source of funding for industrial facilities that positively impact the surrounding areas, creating many direct and indirect jobs,” said Tom Rosenfeld, CanAm’s President and CEO. CanAm Enterprises (“CanAm”) announces that its 37th EB-5 partnership has repaid recently. The two-phase Gulfport Marine Terminal project in Staten Island, NY has repaid its first tranche of EB-5 loan funding in full and on time. The 37th repayment further establishes CanAm Enterprises as the industry leader with over $1 billion in EB-5 capital repayments. The $40 million EB-5 loan through CanAm’s New York Metropolitan Regional Center helped fund the first phase of construction of the Gulfport Marine Terminal. Subsequent phases of the construction project are well underway with nearly 2 million square feet of industrial logistics center space completed. The construction of the Gulfport Marine Terminal has created 1,671 jobs within the geographic boundaries of the New York Metropolitan Regional Center area, which exceeds the EB-5 investment requirements of 10 jobs per investor by far. The legal conditions for EB-5 visas have been fully met, meaning all 80 investors qualify for receiving permanent residency in the United States. The Gulfport Marine Terminal is being built on a 674-acre tract of vacant land located on the Arthur Kill waterfront in Staten Island, Richmond County, New York. The terminal features a 135-acre area, which is ready for development of a full-service port facility, and a 193-acre on-site logistics center. The first two buildings in the logistics center are completed and open. A one million square-foot building occupied by Ikea opened in August 2018. 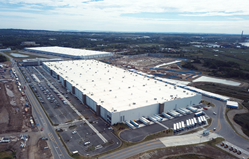 The second, an 850,000 square foot robotics-enhanced fulfillment center for Amazon opened in September 2018. The opening of this second facility is significant in that it marks the first fulfillment center Amazon has located within New York City. Both companies are now the largest employers in the borough, bringing even more economic growth and opportunities to Staten Island, NY.